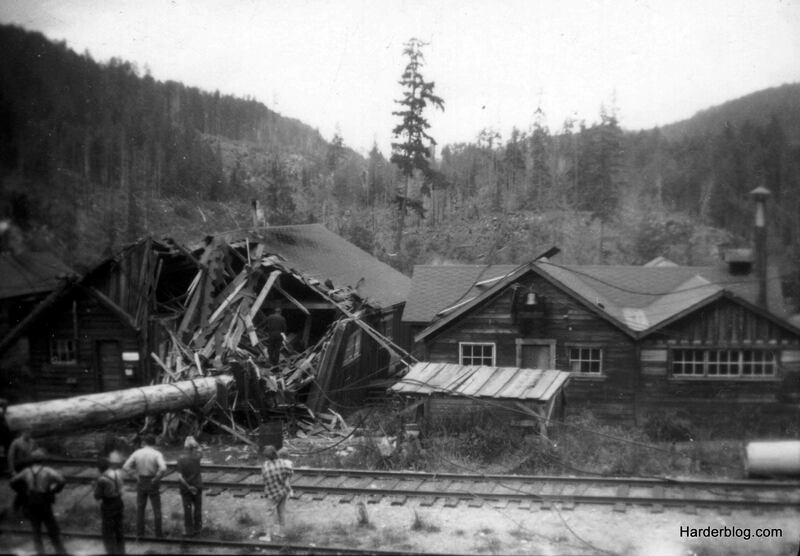 1950 – With a crash and a shudder as a youngster I was introduced to the forestry business as the spar tree fell onto the general store a few short steps from our shack at the Leechtown lumber mill. Sitting on my mother’s hip I surveyed the damage and dreamed of the chocolate bars inside. My father captured the moment in the rare photo of the day below. It was a life of rides on steam locomotives, fresh venison, coal oil lamps, and visits to the Chinese bunkhouse for lichee fruit amid the smell of opium smoke. It was a simple time on Vancouver Island. 1966 – University of Victoria and smoke of a different kind. 1975 – Ralph S. Plant Ltd. and Widman Industries had joined forces with a new credit manager for Jack Hetherington, Paul Plant, and Charlie Widman. 1986 – Taiga Forest Products Ltd. was spreading its wings and needed a new credit manager for Pat Hamill and Doug Butterworth. 2014 – After 28 years with Taiga (and it may be true I was unable to find any other employment) it is now time for retirement and to let the younger and less experienced have some fun. When I began in business we used carbon paper and dreamed of the promised paperless office; now we have computers and can make bigger and faster mistakes. We sold full carloads of lumber and never dreamed of dealing in truckloads; those cars averaged far less than $8,000 – some as little as $3500 – with the prepaid freight being more than the lumber. 2. If it’s not fun, go do something else. This entry was posted in Industry and tagged forest industry, lumber wholesale, vancouver. Bookmark the permalink. Great photo! Reminds me of Bear Bay, Bute Inlet Thank you. I doubt logging camps look that friendly, homey anymore. Our family to live in a logging camp @Bear Bsy Bute Inlet ,,,say 1950 to 56.,, my father owned it, he might have called it E & O Logging. We left & moved to Mayne Island as needed to have access to a school. ( pls excuse me if I told you that before.